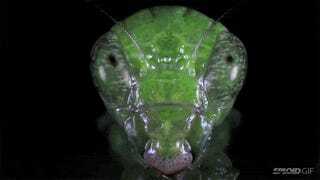 I didn’t expect it to be, but staring straight into the eyes of these fascinating bugs is chilling. The clear, close up shots of their heads and the incredible, foreign detail of their eyes and bodies makes them seem like they’re not a part of this world. I mean, you could totally convince me that these are aliens.